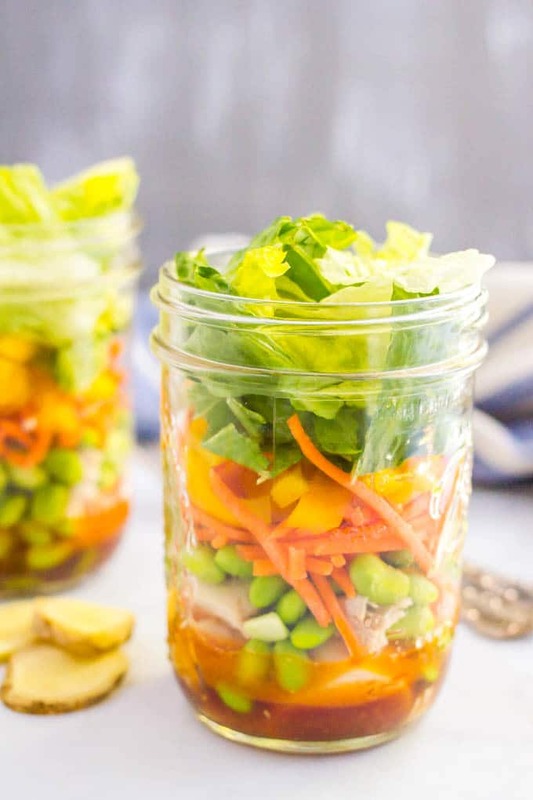 Asian chicken mason jar salad with rotisserie chicken, edamame, carrots, peppers and an easy soy ginger dressing are perfect for a healthy make-ahead lunch! Hello again to Monday… how do you always sneak up on me?! We had a fun weekend of just me and the kiddos while my husband was away. M and I did a Facebook Live with some of our favorite cookout sides. We took those to our neighbors house that night for a little get together. A new week is here though and I’m gonna try to get after it! Starting with having some yumminess on hand! I have been ALL about the mason jar salads recently. Have you tried them? I pull out some ingredients, layer them up and I’ve got some gorgeousness sitting in my fridge, just waiting to be devoured for lunch that week. It’s especially good for me because my lunch break is spent picking up the kids from school or camp and then catching up on my deadlines for my job as a health/nutrition editor so sometimes it’s creeping on 2:30 and I want lunch ASAP! We’ve got rotisserie chicken (hello easy! 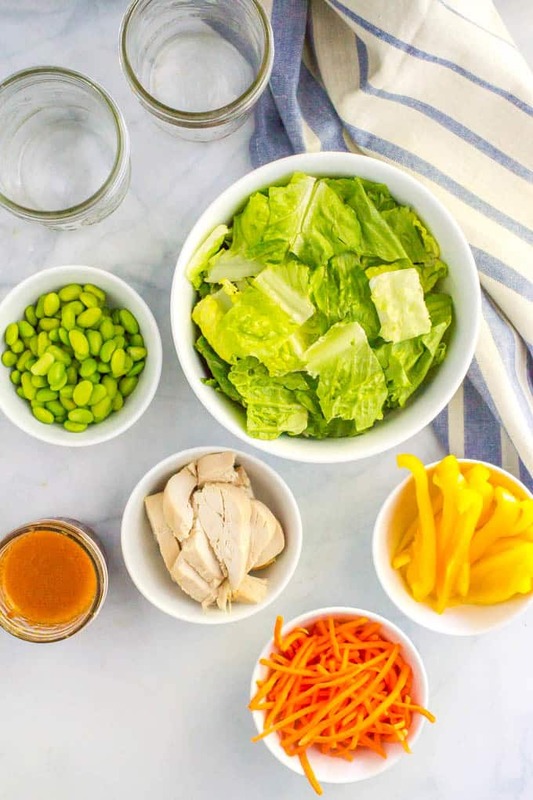 – or use any leftover grilled or roasted chicken you have on hand), steamed tender edamame, matchstick carrots, pretty, sweet bell peppers strips and crunchy romaine lettuce, all with an easy and super addictive soy ginger dressing. 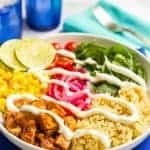 Looking for some more info on mason jar salads? I got ya covered! The dressing goes in the bottom. The protein (chicken/meat/beans) goes next – these won’t get soggy or break down from sitting up against the liquid for a few days. Layer up your veggies – add the most hearty ones to the bottom and the most delicate ones closer to the top. Finish with your lettuce at the top of the jar – and cram in as much as you can! What do you do when you’re ready to eat it? You turn the jar upside down and dump it out onto your plate or in a bowl. All the ingredients fall together and the dressing, from the bottom of the jar, ends up on the top of the salad. Brilliant! My husband loves these jars but needs a bit more of a substantial lunch to fill him up. So we pack him some pita chips, or tortilla chips, or crackers or some fresh bread to go with it – or maybe some nuts or cheese. Just use whatever works with your salad. Cause I mean, how good does this look?! And if you’re totally on board like me, tell me your favorite combos! I’m always up for trying new ones! P.S. I love these wide mouth 16 oz. mason jars for this recipe. 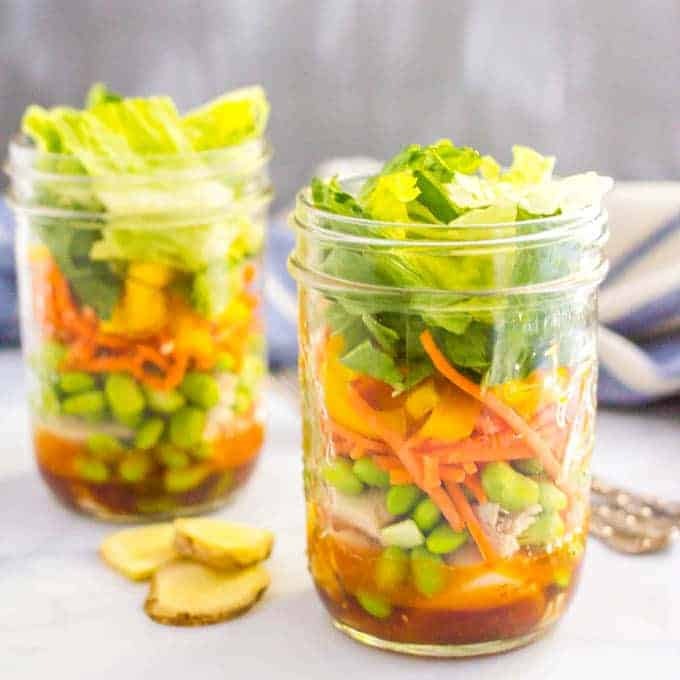 Asian chicken mason jar salad with rotisserie chicken, edamame, carrots, peppers and an easy sesame soy dressing are perfect for a make-ahead lunch! Add about 3 tablespoons of dressing to each mason jar. Divide rotisserie chicken between the jars. Then divide remaining ingredients between the jars, finishing with as much lettuce as you can fit into the jar. Store in the refrigerator for up to 4-5 days. To serve: Turn jar over onto a plate or bowl, to dump out ingredients and leave the dressing on top of the salad. I love these wide mouth 16 oz. 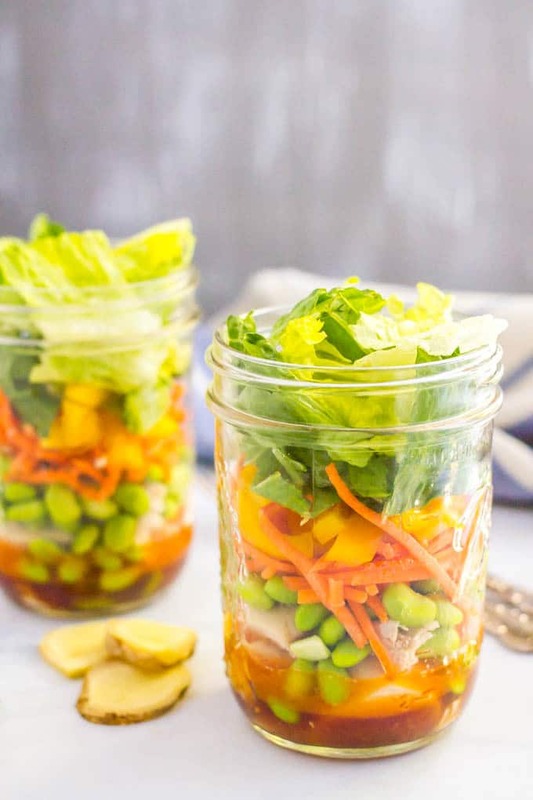 mason jars for mason jar salads. These will keep in the fridge for up to 4-5 days. I like a lot of lettuce for my salads so I pack some extra chopped romaine lettuce in a plastic bag or container to dump my mason jar salad on top of when I'm ready to eat it. 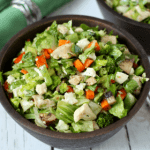 You could also add some chopped peanuts on top of this salad. Just pack a small bag or container separately so they don’t get soggy from the veggies in the salad. 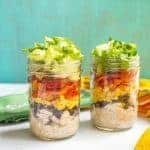 I love the colors in this, and salad-in-a-jar recipes are perfect for whenever I’m on the go! :D! Can’t wait to try this out! Yay, I hope you give it a try Farrah! 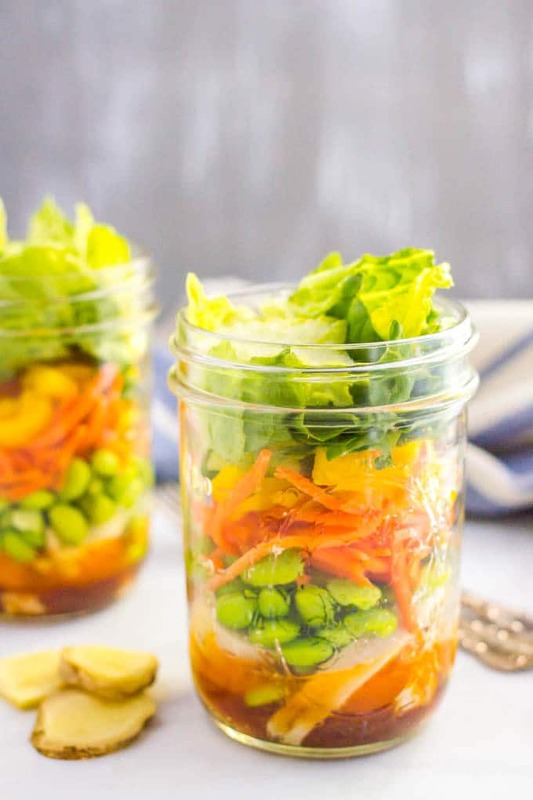 Mason jars are such a fun vehicle for salads, the layers are always so beautiful! 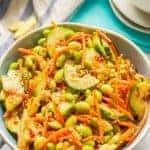 And the flavors in this recipe sound delicious, I’ve never tried edamame in a salad before! Aren’t they so pretty and fun?! 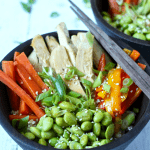 The edamame really works well here – I hope you try it Luci! I loveee mason jar salads since they’re so easy to bring to work! 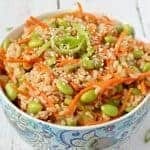 And I’m a huge fan of Asian salads, so these look fabulous! !